It's the most wonderful time of the year! The holidays are a season full of family, friends, cheer and lots of crafting. 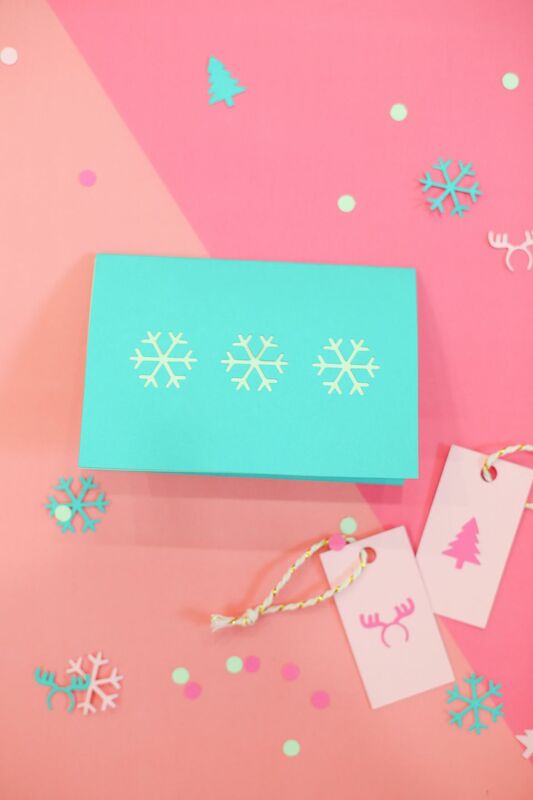 This year, put a very personal spin on your cards and gift tags with this pretty, colorful paper cut idea. The possibilities are endless–use your favorite holiday color combinations and some fun shapes to create completely one-of-a-kind cards and tags. Send them and gift them to everyone on your list and your gifts will have a little extra something, made with lots of love. 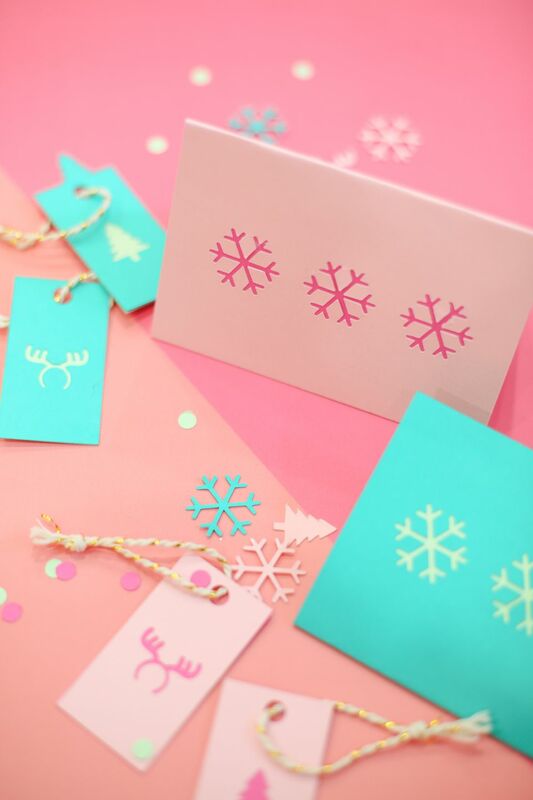 To make it simple, we've provided printable templates with the designs that we used on our cards and tags. You can also create your own with any fun holiday designs you like! To create cards and tags like ours, print out our two templates. The templates include one card and two gift tag designs. Template #1 contains the front of the cards and tags, while Template #2 contains the backings for the cards and tags. In addition to the templates, you'll need the following materials. If you're using a craft knife and scissors, start cutting out your front designs from Template #1. Use scissors to cut around the borders of the tags and cards. Use a craft knife to cut away the interior designs (tree, snowflakes or antlers). Cut away all of the black so that there is empty space where the printed designs used to be. If you're using a cutting machine, upload our designs into your cutting machine's software and adjust the settings to cut away all of the black space. You should be left with tags and cards, and negative space where the black designs were printed. Use the same process to cut the pieces from Template #2; this can be done with scissors. This should be on paper in a contrasting color to the paper used for Template #1. Use a hole punch to punch the hole out of the tags. Spread a thin layer of glue using the glue stick on the back of the card. Just spread on the top half of the card, where the backing will cover. Carefully align the backing and adhere it to the back of the top half of the card, creating a contrast to the front cover. You should be able to see the color of the backing through the snowflake holes. Repeat this process to add the backing to the gift tags. Carefully crease and fold the card in half. String baker's twine through the holes on the gift tags, if desired. Repeat this process for all of the cards and tags that you make. Write a few Christmas cards, wrap a few gifts and spread lots of holiday cheer!